When we think of baby animals like chicks, lambs, piglets or calves, innocence and cuteness often come to mind. Most of us will never deliberately hurt a baby animal, not to mention torturing him or her. However, when it comes to our food choices, many of us pay other people to torture baby animals (and adult animals) in the most horrific ways. In the dairy industry, many farms decide to get rid of their male calves (since unlike the female calves - male calves won't produce milk) by bashing them in the head with a hammer or an axe. Although dairy farms can generate profit from sending the male calves to slaughter, some farms prefer to be done with the male calves as soon as they are born. In the egg industry, male chicks who are just one day old are thrown into a grinder and macerated alive, simply because they won't produce eggs. One method for sorting out the male chicks is to use a genetically modified breed in which the males have a darker shade of yellow. In the foie gras industry, it is the female ducklings that are thrown alive into an electric mincer after they are born. Only male ducklings are kept and raised as they gain weight much faster compared to the females. 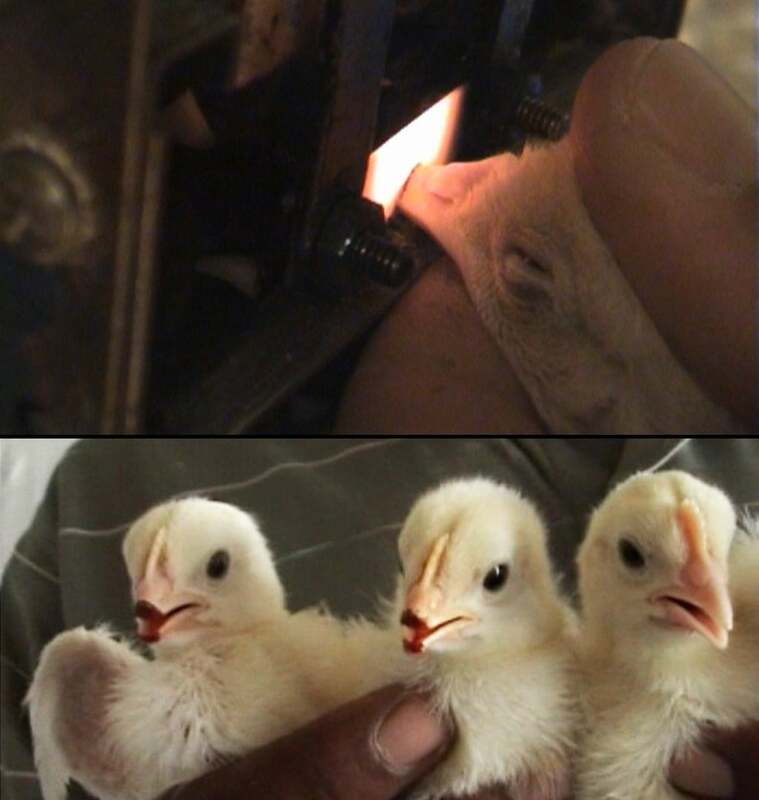 Sadly, the horrible practice of grinding baby birds alive is not exclusive to the industries of foie gras or eggs. The same violent death awaits weak or deformed chicks or baby turkeys who are bred for meat as well. Since the meat industry uses a breed that was genetically altered to grow very fast, many baby birds hatch with different deformities. Generally, the USDA doesn’t allow meat with a boar taint smell to enter the meat supply. Boar taint is associated with the hormones that are naturally produced by intact males. Therefore, nearly 100% of male piglets who are raised for meat in the US are castrated. However, even in countries where it is not mandatory, piglets are still being castrated so they don’t develop that smell. A very common procedure would involve ripping or cutting the babies’ testicles, without the use of any painkillers or anesthetics. Sadly, piglets are not the only baby animals who undergo this painful procedure. Lambs, kids and even baby cows, also have their testicles removed without pain killers. The reasons for castrating babies vary from assuring the meat smells in a certain way, to making the animals more submissive. The process of burning off the beaks of baby birds such as turkeys in the meat industry or chicks in the egg industry is known as ‘debeaking’. This process, like most mutilations done to animals in the food industry, is done without any painkillers or anesthetics. The beak will most commonly be shortened permanently, though sometimes regrowth may occur. Birds in both the egg and meat industry will be forced to live in sheds with thousand others of their own kind. In such stressful situations, the birds can resort to self-mutilation, bullying and pecking. This is why the industries cut the beaks of baby birds - to decrease the number of injuries. Debeaking is an extremely painful process because the beak is very sensitive and full of pain receptors, blood vessels and nerve endings. Despite this, most egg farms, including those labelled “cage-free” and “free range”, purchase chicks who had their beaks cut. In the dairy industry, it's standard procedure to take the calf – whether male or female – away from their mother shortly after birth so that we, instead of them, can get the milk. In order for cows to produce milk, they need to be pregnant. And just like humans, cows carry their babies for nine months. However, usually within just a few hours of birth, the babies are snatched away from their mothers. Female calves will be forced to suffer the same fate as their mothers, while male calves are killed shortly after, many times to produce veal. Unfortunately, the dairy industry is not limited to cows as goats and sheep are forced to go through this traumatic experience as well. All birds in the food industry, such as the chicks raised for egg production or the turkeys and ducks raised for meat, never see their mothers or feel the warmth of a nest. Instead, they are hatched in large incubators and huddled around heat lamps to keep warm. Incubators can hold up to thousands of eggs that are hatched in a controlled environment. When they hatch, chicks, baby turkeys and ducklings can be heard calling for their mothers, but to no avail. All of these babies rely on their mothers for protection and guidance. At this age, they just want to follow and be near their mother, who is supposed to take care of everything else. When we force baby birds to grow up without a mother figure, it causes them a lot of stress and anxiety. PACing (also known as thumping) is a term which means “Pounding Against Concrete”. This is a method used by the meat industry to kill unwanted piglets. Sick or non-viable baby piglets will be picked up by their hind legs and slammed against concrete. This causes a massive head trauma which often leads to an agonizing and slow death. Pigs who don't die immediately are left to squirm in agony and some even have seizures. So what can I do to help these babies? In order to make this world a kinder place for babies, try to be vegan for 22 days. We highly recommend to join Challenge 22+ for both free guidance and support. Audrey is an aspiring writer and avid animal lover who is passionate about spreading awareness on issues that relate to animals. Apart from writing, she loves to spend her free time with her companion dog and hamsters, and further exploring new interests. This should be shown to everyone. They need to see just what they are paying for. To see the innocents treated this way would make many people vegans. Have a heart and GoVegan. The most evil animal on this planet is the 2 legged humanid. It makes me sick to look at these pictures but as a Vegan I am pleased not to be a cause of their suffering. How anyone can eat meat or fish after seeing this is beyond me! If you struggle with the concepts shown here imagine that every animal pictured is your pet dog or cat! How does it feel? We do not need to eat animals of any kind, nor do we need to wear their skins, or drink their milk! It is not an effort to change, but it does take belief, belief in yourself and in what you are doing, be prepared to be attacked by others and ridiculed. I was. But I am still vegan and not likely to change! I am just speechless on these cruel acts of my own specie , I wish it must be stopped , at least these torturous way of hurting & killing the poor young birds & babies! I am ashamed ! 1000 apologies from my side to those innocent birds & animals . It must be stopped as soon as possible.